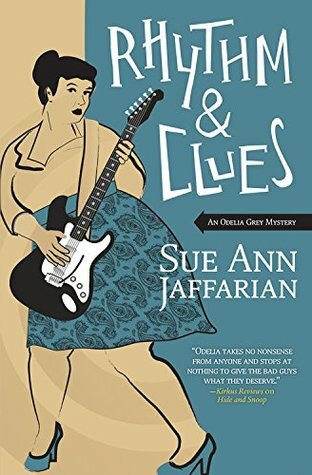 Rhythm and Clues by Sue Ann Jaffarian is ‘An Odelia Grey Mystery’ meaning it’s part of a series featuring the same character. Odelia Grey, is an older, over-weight (oops, sorry, the correct term is ‘plus-sized’) woman with a certain amount of sass and pizzazz who sticks her nose into mysteries. I’ve never read an Odelia Grey mystery before this, but I was attracted to the theme of music and mystery. Odelia’s mother lives in a gated retirement community and is concerned about her neighbor – Boaz (Bo Shank) Shankleman. Bo was once a rock and roll star in a band that Odelia really loved (Acid Storm) in her younger days. Bo, it seems, has disappeared, along with his dog. But Odelia gets drawn into the situation when her mother calls her from jail. She’s been arrested for breaking and entering Bo’s home. But it was the dead body in the house that really got her (and her friend) in trouble. I find this to be the most difficult book to write a review for. I find nothing ‘wrong’ with the book except that it doesn’t grab me. The writing is fine and the character is moderately interesting, just not appealing to me (and not because of her size – that was actually the most interesting part about her). With so many different types and styles of mysteries out there, not everything will appeal to everyone. This one doesn’t work for me. Looking for a good book? Rhythm and Clues by Sue Ann Jaffaria is one of a series of ‘Odelia Grey’ mysteries. It is very average mystery storytelling and the music theme is not well-developed.